San Francisco Metblogs » Does it work? We’ve all learned at age five (plus or minus a few years) about apologies: something as simple as “I’m so sorry” can mend friendships and make small mistakes seem insignificant, while some apologies, when written down, are the length of the latest Harry Potter book. 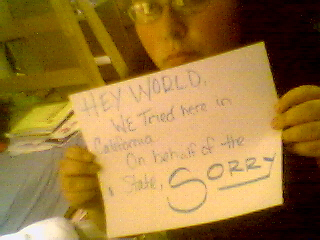 From SF to NYC, people have been apologizing to the world about this year’s election, sparking sorryeverybody.com. I hope the world accepts it. Wonderful! Really bizarre and comforting too. P.S. I miss San Francisco so much and I was only there for nine months. now back in Madison which is NOT the Berkeley of the midwest whichever other merits it may have.